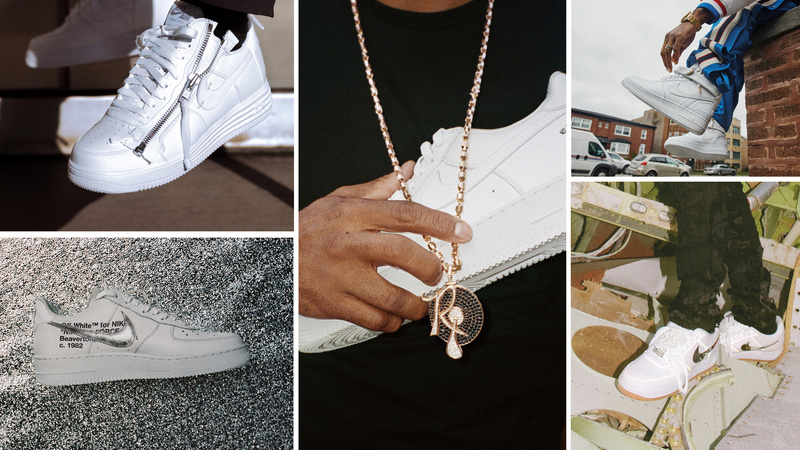 To celebrate the 35th Anniversary of the Air Force 1, Nike has collaborated with visionaries from around the world in celebration of the shoe’s defining colorway, white-white. In the end, Don C, Kareem “Biggs” Burke, Errolson Hugh, Travis Scott and Virgil Abloh all offered their distinct view of the icon. Here’s what they envisioned and how, together with Nike, they brought it to life. “When we first met with Travis, the first thing he said was, ‘I’m the acid of rap.’ It was a prompt to take a classic but then really trip it out. We brought this idea to life by making the binding around the canvas reflective, so when it hits light, it reflects various colors. “We worked together to decide where elements of the Air Force 1, 2 and 3 could be incorporated. The medial side of the shoe was taken from the Air Force 2 and the heel from the Air Force 3. It all rolls together nicely while still staying true to the classic Air Force 1 look.